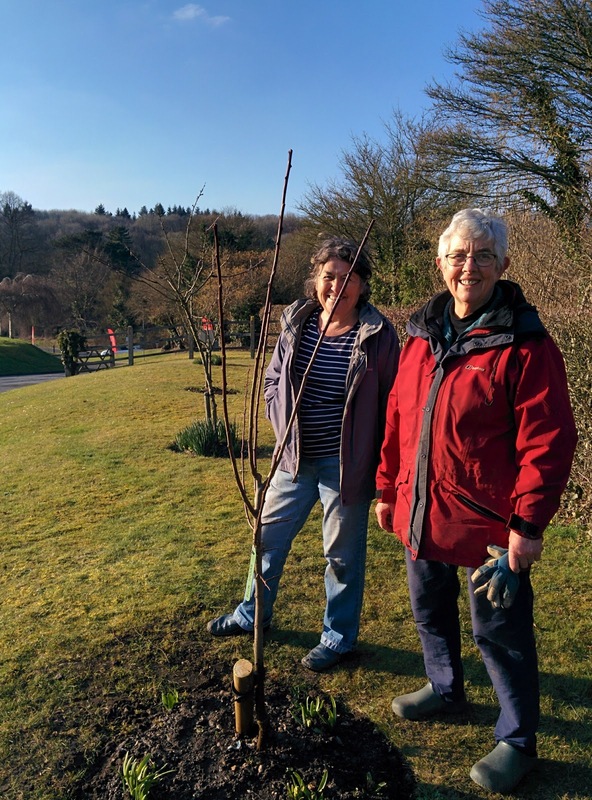 On a cold, sunny afternoon we replaced the Victoria plum in the community orchard at Jubilee field with a Marjorie seedling plum. The Victoria plum has not fruited well for us, and we’ve put this down to the exposed position of the orchard, which means the blossom is exposed to frost and harsh winds, adversely affecting pollination. The Majorie plum flowers three weeks later than the Victoria which we hope will suit the position better. As the Victoria seemed to have good roots, Ann has taken it to plant in the Vicarage plot, which is very sheltered in comparison. We gave all the trees a winter wash, to kill any dormant pests on the branches, and gave them a top dressing of fertiliser. In a few weeks we shall be enjoying the blossom on the trees – do look out for them if you are near the Sports Centre. You can find a map of all our plots and planters on our Plots and Planters page.